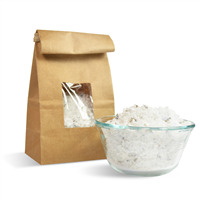 Create a line of pampering spa salts with this easy project. The European Spa Salts are solar evaporated and harvested from the pristine waters of the Mediterranean Sea. 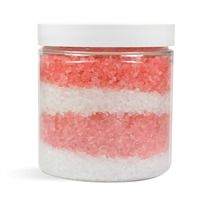 The salts are scented with Relaxation Fragrance Oil which is a pleasing blend of patchouli, rose and sandalwood. COMMENTS: These little cuties are adorable. Love the kit. 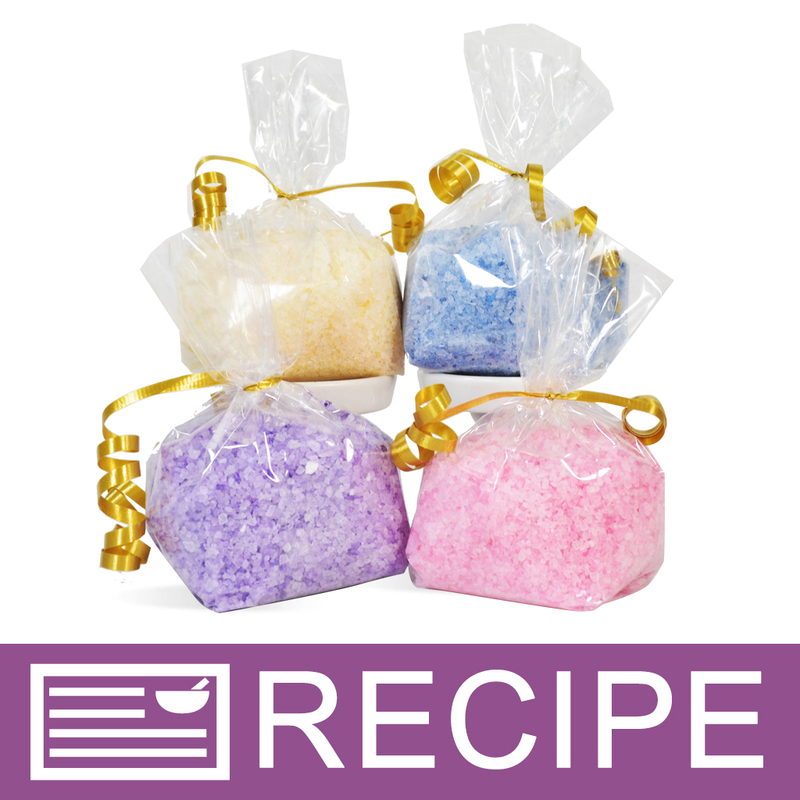 Very easy to follow and the outcome is perfect little gift size bath salts. COMMENTS: The scents all smell nice. COMMENTS: This kit is okay. I do like all the fragrances but I do not like the look of the finished product. I wish that the final look was a little more elegant like the botanical salt kit. • Final look needs to be more elegant. COMMENTS: I made these as soon as they arrived and they were sold before I finished bagging them up. The scents traveled through our building and customers came running. COMMENTS: Best bath salts I ever had. This kit is very quick to complete. My customers really love the fresh smelling scents and colors. I would do a kit like this for different holidays: Valentine (Red), Christmas (Green, Red), Mothers Day (Pink, Purple), etc. • I would do a kit for different holidays. COMMENTS: Love the scents in this easy to make kit! 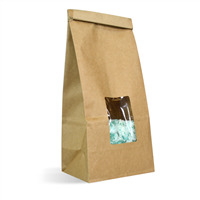 This is a good starter kit for getting a beginner going with making salts because it makes the decisions for you about colors and scents. Highly recommend! Cost is great too. COMMENTS: Awesome kit. A beginner would have no problems with it. This was my first time using colors in bath salts. I substituted scents and packaging (I used 4 oz clear basic plastic jar with white straight top cap 58/400) since I will be selling them at a Ladies Retreat, and the outcome was very professional looking and eye pleasing with the included colors. I also added jojoba and sweet almond oil. I would definitely purchase again. 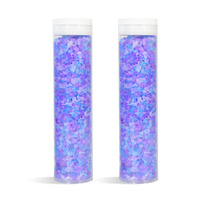 "The title of the kit (Spa Bath Salt Kit - Four Scents and Colors) indicates there are multiple fragrances in the kit but in the kit description and item listing there is only one fragrance listed. So are there four scents in the kit or not?" Staff Answer We do apologize for any misunderstanding. The kit contains four colors but only one fragrance. We have updated the kit to reflect this. Thank you for bringing this to our attention. "Since you are using micas do you need to use polysorbate 80 to prevent tub staining? I made a similar salt and used mica and it left color on the container that I used to test it. But then I used polysorbate 80 and it clumped. Any help appreciated! Thank you! " Staff Answer Any color you use will leave some residue. You might try adding a little less color with your salts. Try mixing the Poly 80 with your fragrance oil and then mixing into the salts. Be sure to let them air dry before packaging. "How much would you sell these for?" Staff Answer We have found that retail pricing can vary greatly depending on the market, location and average pricing for your location. Therefore we feel that it is more beneficial for our customer to set their own retail pricing. I would recommend an internet search for similar products to get a base price. Your retail price should be based on your purchase cost, labor cost, current market pricing and client base. Or you could use this formula: Supply cost x 4 = Retail.